Definitely lemon, Robin – I always squeeze half in and reheat with a couple of fat lemon slices too, to boost the flavour. A little thai fish sauce works wonders, adding that elusive depth…and it always benefits from maturing a little…a day or two in the fridge will do it! Another thing I often do when serving the next day is to discard the original veg & add fresh new ones to the boiling soup. Can you tell I had a Jewish grandmother?? Hoping that Meredith is fighting fit again soon…tell her to give in for a day or so & she will get better much more quickly! Good advice–she’s resting up and happy to do so. Lemon will go in next time–thanks–and one off our tree! We are needing some chicken broth too here, sounds like an excellent idea! I add a few (3 or four) cloves. Cloves are good–and more than one–thanks. on December 30, 2011 at 3:05 pm | Reply Alison M.
Sorry to hear Meredith is laid low. This looks delicious, Robin, though I’m always left a little unimpressed when I make it, too. I think canned broth contains so much more salt, (unless it’s the reduced sodium kind), that we’ve become rather accustomed to that being the taste we look for, even crave. Since I’m guilty of being rather heavy handed with salt (my excuse when I get the odd look for slathering buttered items liberally with it is that I require it for “traction”), I’d say throw a good dash in – don’t be shy (it’s good for colds, sore throats, general lurgies). Thyme is a nice addition, and has cheering and comforting effects. Aside from that, I sometimes thicken the broth just a tad – mix some broth with cornstarch and add it back in – just gives the broth a slightly more substantial consistency. Failing that, I highly suggest a good wallop of a fine single malt whisky – which in all honesty, woul dbe my first line of defence. I hope Meredith feels better, and wish you both and your many animal friends, a healthy and peaceful new year. Good wishes to you too for the New Year–thanks. Thyme is going in next time–I love it. My mom would make chicken broth using just chicken backs and necks, with the usual veg. Then after it was done, she would boil that broth with another couple pounds of backs and necks and make it double strength. Ahh, Jewish penicillin! When I am feeling punk, I sprinkle cayenne pepper on it. Question: is fennel the same as anise? I asked the produce man at the market where to find the fennel, and he said, “the anise is over there.” The label said fennel. I was confused, and since each bulb was $3.00, I decided to skip it. I may need to grow some! I just read in Nancy Harmon Jenkins great book The Mediterranean Diet Cookbook that fennel is often called anise in the States–it does have an aniseedy taste and smell. Using backs and necks is a good idea–I see them sometimes. Thanks. Thanks Beatrice and the same to you and yours. Yup–those big birds feature here as well. Very sorry for Meredith :-0 I can advise you two best medicines of my dearest grandmum (your fan, of course): warm-broth and also warm-redwine with honey, cinnamon and clove. Again many wishes and a big kiss to Meredith, Bea. we are both going to try the warm red wine tonight–sounds just the thing for New Years Eve! Good tip–thanks.It is simmering now for Meredith’s lunch. 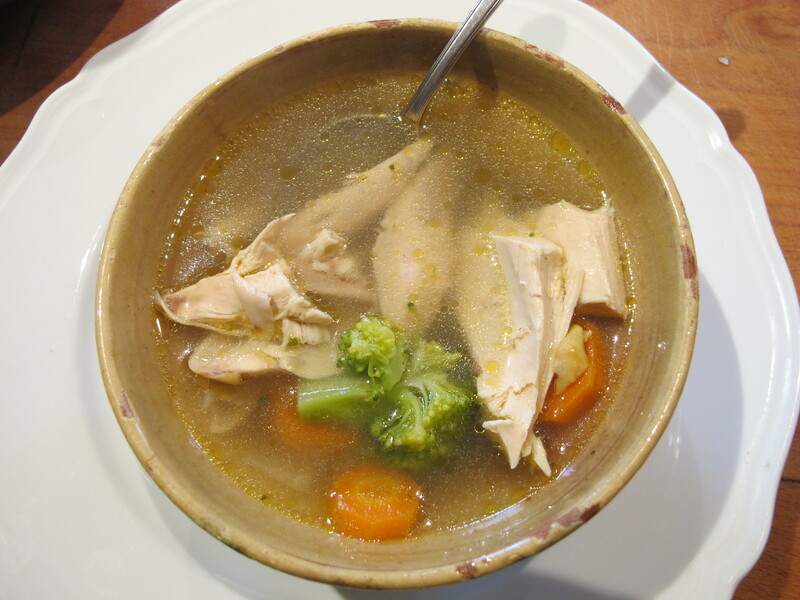 So sorry to hear that Meredith is unwell but chicken soup should help her get well very soon. I usually add some chilli into mine fresh, dried or ground helps with any swelling of the throat and nose. I sometimes add a spoonful of Miso, that helps the depth of flavour. Chili’s a good idea thanks. Please feel better soon, Meredith!!!! I do find also that making chicken soup is discouraging. It’s not difficult, but given the quantity of ingredients, the results can be disappointing. I long ago gave up using a whole chicken, especially the ones the supermarkets carry which are small and young birds, without much flavor, especially in the coveted breast meat. I make my soup from chosen parts: wings, thighs, legs. The bones add flavor as well as some gelatin for a palate-pleasing comforting feel. I sometimes add in an extra pound or two of ground chicken if I can find it, but not as a substitute for 4-5 pounds (2-2.5 kilos) of parts. In the olden days, chickens were larger, older, and much more full of flavor. Today’s chickens, even in butcher shops, tend to be smaller and younger birds, unless I ask for a “fowl” or a “hen”–that is, an elderly chicken. I’ve never added broccoli to my chicken soup (I like it, but it has a strong flavor) or fennel (don’t like it, ever!) but I add a larger quantity of vegetables and herbs–another large onion, more celery, lots more carrots, some parsnips and leeks, quite a bit of dill (fresh,or dried), maybe a pinch of dried sage or thyme, more parsley. You used quite a bit of veg. stock. I use half water and half organic canned chicken broth, or I suppose I could use organic cubes. ( It’s not a cheat, but an enhancer. That’s my story, and I’m sticking to it.) I cook uncovered at a slow boil for 1.5-2 hours, and the liquid level comes down quite a bit. Then, I strain it, cool it, , refrigerate, skim the fat. As with other foods, overnight refrigeration melds the flavors, though that doesn’t help broth-waiting invalid as quickly. I also as above add fresh sliced carrots and some celery to the reheating soup, and if the flavor isn’t where I want it, I reduce the liquid some more while reheating. Yes, quite a process, which is why I don’t make it often. It’s already tasting better after a quiet night in the fridge! Poor M – hope she feels better soon!! Thanks–I’m going to try it next time with a cooked bird. Robin I am sorry to hear that Meredith is feeling unwell and hope that she will soon be back to good health again.Chicken broth is always rather thin,but I follow mum who added some pearl barley and split lentels, then added at the end some corn/or plain flour mixed to a rue,as a thickener. Or there is alway dad’s remedy that I ALWAYS follow, a good dram of whiskey just a spot of honey and a few drop of lemon juice, you may need to repeat the doseage several times – Get well soon Meredith,I am sure that you are in very good hands,and being well taken care of. She’s following your advice–and doesn’t seem to mind repeating it! Grandma Lippman (Romanian Jewish mother of John Randolph the actor) added some things but not all that you used. Her soup always had onion, carrot, celery, and a leek, and parsley and dill. Never garlic (although that is great for a cold) or fennel. She used an older chicken for flavor (pullit or stewing chicken) and they are hard to find in the US these days. She left the veg in large hunks and discarded all but the carrots, serving a clear soup with egg noodles or pasta barley, matzo latkas, and the cut carrots. It is my family ultimate comfort food. The dill makes it for me and yes we also skimmed off the fat that rose to the top after chilling. These days I have to add some chicken broth powder to get the flavor cause the chickens just don’t have it. Salt and pepper to taste of course. Chickens ain’t what they used to be! Hi Martha–I remember John with great affection. Dill is a favourite here too–when I can find it. Oh, that chicken soup looks delicious. I wish the internet allowed me the ability to reach into the screen and syphon some out. It’s just the cure that I need now for my ticklish throat. It’s all due to the weather changing from 20 – 60 degrees and then back to 20. Sorry, I can’t offer any advice, I’m an adamant broth in the can kind of woman. Do hope Meredith is on the mend, and a happy and healthy new year to you both. Robin: I am a soup fan. I always have a batch of thick and hardy soup either in the refrigerator or freezer. My favorite is chicken and turkey. I always make my own stock. It can be time consuming but well worth the effort. I do the following: I bake a roasting chicken, usually a 8-9 pounder. After baking I remove all the meat from the bones which I will use in the soup. 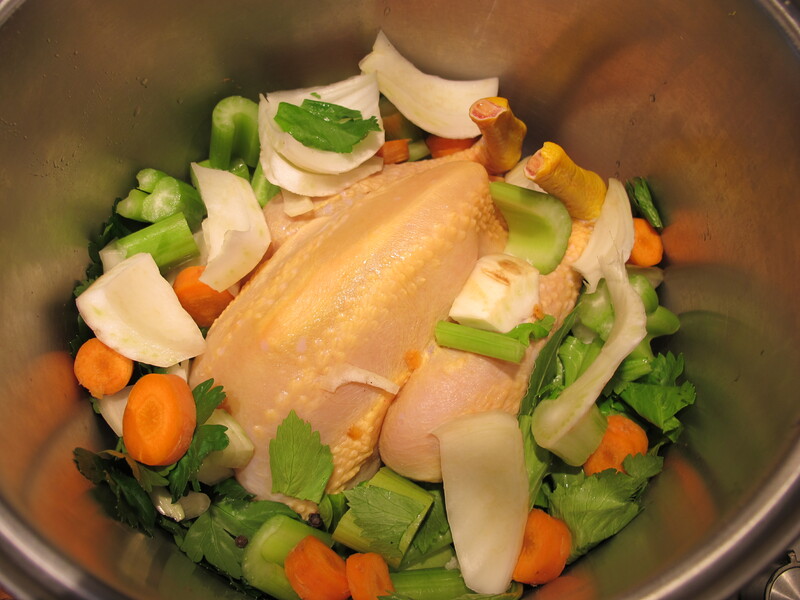 To a stock pot I add the chicken bones, skin and any parts leftover after the meat is removed. I also add any juices from the roasting pan which I baked my chicken in. I add 2 large onions, celery stalks and leaves and of course salt and pepper. I add enough water to cover and try and gauge by eye the amount of water needed for a pot of soup. (I usually cook in large quantities for freezing). I will bring to a boil and turn the flame down to low and simmer for 2 hours so the flavors will mingle and infuse into a broth. After it has cooked for the designated time, I remove the bones and any solids from the pot. After the broth has cooled I will strain the fat off in a gravy strainer. Since the skin was cooked in the pot there will be a lot of fat– hence the flavor. Once I have my clear, fat free broth I can proceed to make my soup by adding the desired vegetables, rice, or whatever you like in your soup, and finally, near the end of the cooking time, the diced chicken meat. I have on occasion made my own noodles which cannot be compared to store bought. One very interesting note concerning the broth: At one time I would make broth by cooking a raw chicken in a pot of water with the onion and celery. Once cooked I would remove the chicken and proceed as above. Quite by accident I discovered that using a raw chicken vs. a baked chicken produces two different tastes of broth. 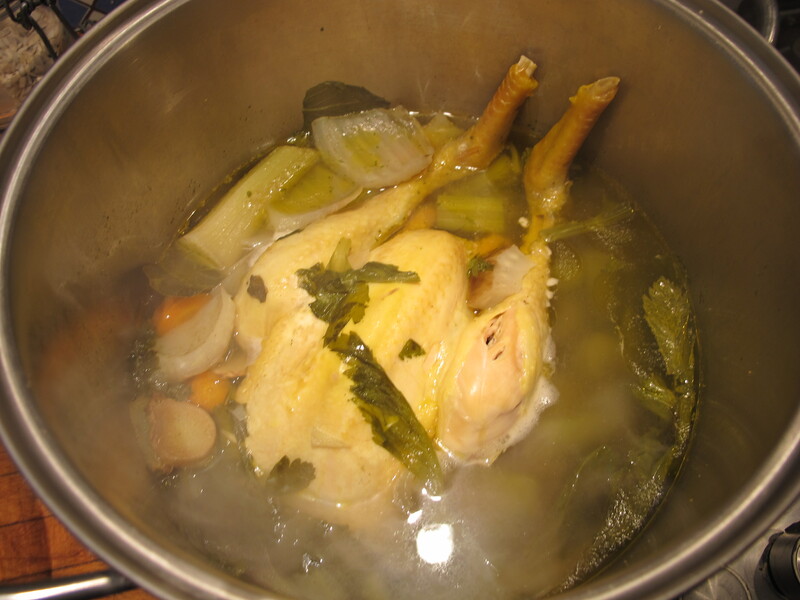 The baked chicken carcass (for lack of a more flowery word) produces a much richer and highly intense broth. I don’t know why this is but my chicken and turkey soup is legend in my family. I’ll try it with a roasted bird–thanks. Seems to me that it would be delicious. I will try it. Of course, Gina being a veggie dampens my opportunities for exporing the world of animal protein, but not entirely. I manage to do a beer barbequed chicken on occasion. Sorry to hear that your bride is frail – especially at this time. But it is what it is. So, wish her well for us. Happy New Year! Hi — I knew an elderly Puerto Rican lady several years ago (my lace teacher). When she felt poorly, she would boil a chicken for an hour or so. No carrots, no celerly, no seasoning. She would sip small cups of the broth throughout the day. It seemed to work for her, and since then we always go for the chicken broth when feeling under the weather. Hope that Meredith is feeling better today. My recipe suggests adding a handful of rice, having strained the liquid from the veg, followed by whizzing some of the veg and adding back in when the rice is nearly cooked. Sounds as though it would have a bit more body, but is it strictly broth then? Failing everything else – what would Ross have done? Come on, Robin, get that brandy bottle open!! Well you are right about the brandy bottle–though he had a habit of throwing it across the room! i don’t think Ross even knew where the pots were kept–so no hope of broth from that direction. full of joy and happiness, this also goes to your lovely puss-cats. Hope you are feeling better Meredith. And a very Happy New Year to you both. Beau is on patient guard duty and only leaves Meredith’s side at the sound of a tin opening! Oh bless – we have got a kitten well a young cat that has started to come and sit by the holly tree,not daft enough to try and go in there,but we have two black bird nests in the bush,It has spotted them and will sit & wait then give a waggle bum and try to jump up,not had any luck yet I think, the little tinker,only doing what comes natural I know, but this young dare devil is a dead ringer for your Beau,black back and white socks. on December 31, 2011 at 4:52 pm | Reply Dianne P.
Sorry to hear you’re starting off the New Year not quite up to par, Meredith. Lots of ingredients have already been mentioned, but cornstarch was the first thing that came to mind. Will add some thickness, but not much flavor. If if were a minestrone, I’d say a bit of rice, or pasta–really cooked, not al dente–might help, too. (My aunt always made her minestrone with a spaghetti sauce base.) If you like turnip, that adds flavor, and even if not cut small, tends to mush apart after sitting in the soup for a day or two. I THINK it might work in chicken soup, but it definitely adds great flavor and body to minestrone. Of course, lots and LOTS of honey-lemon herbal tea with real honey usually does the trick…and hot chocolate lifts the spirits when the tea gets boring! Cheers & hugs to you both! on December 31, 2011 at 5:27 pm | Reply Dianne P.
OK, more ideas on the soup…My sister, the REAL cook in the family, just called so I asked her advice. “Ooh, if they like curry, that’s the BEST!” Bingo! I know you folks like that, but there’s more. She sometimes adds a handful of chopped-up kale or spinach–that sounds good–and my niece adds her own twist: one mashed sweet potato. With all these ideas, I think you might need to write a new cookbook, now, Robin! Shopping is the first task in the New Year!–Thank you and your sister. Happy new year Robin And Meridith! I raise my glass to you both, from the edinburgh street party!, 80,000 party goers here,get well soon meredith. This has been a very interesting thread…..it is apparent that people are passionate about their chicken soup. There is a baseline to the recipes listed but everyone has a slight variation. Can’t wait to try a little lemon in my next pot of broth. A number of years ago, a self-help book was published under the title “Chicken Soup for the Soul.”. We all can feel the implications of that reference–however much we like other soups, it wouldn’t feel the same if the book were titled, say, “Leek Soup for the Soul.” But I digress. As long as we’re adding wonderful lemon to the broth, don’t forget the Greek variation called avgolemeno. Lots of lemon, beaten egg yolks (don’t boil it after that) and a good handful of rice or orzo. You forgot the thyme. Thyme always goes in chicken soup. My grandmother’s recipe. Also I have recently read that the Thyme in chicken soup helps with the aches and pains of flue or cold. It tastes good too. To me it is one of the traditional tastes of chicken soup. I hope that helps. Thanks–hope you are on the mend. Just looked at your blog, Jafagirls, and was very impressed!! Love your artwork & style–and that doll tucked up in bed…. Trying this out today as I have a poorly husband with the lurge in need of TLC and comfort food. Will add lemons and some pearl barley and see how it goes. I can’t believe I went all these years without eating fennel. I bought it for the broth (which by the way was lovely). You see I am a licorice fiend of the worst kind, and now I think I may be a fennel fiend lol!